News at The Telephone Museum - The Telephone Museum is operated by The New England Museum of Telephony, Inc.
Our New Look Many thanks to everyone who donated to the “Barn Fund.” You can see for yourself what an inviting entrance the new windows and doors present to our visitors. This was truly a membership-driven project with additional interest from donors all over the country in preserving the look of the main building and the exhibits within. A new exhibit at The Telephone Museum opened on June 18, 2016. 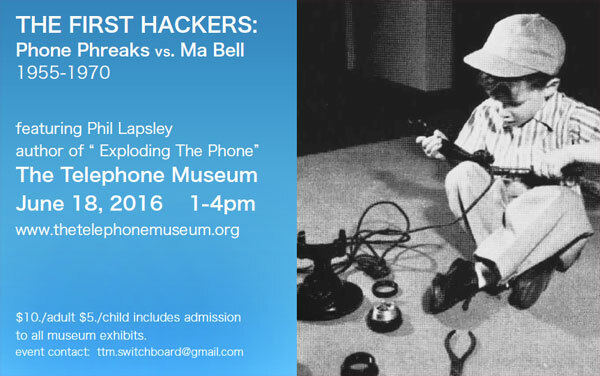 The exhibit is based on the book “Exploding The Phone” by Phil Lapsley. Mr. Lapsley was present at the opening to give a short talk at 1pm and stayed to sign copies of his book. The admission price of $10./adult and $5./child included all museum exhibits. Free admission for museum members. With a forward by Steve Wozniak, and details about the exploits of the telephone hackers, the book is a timely trip back to the origins of hacking before computers were “personal” and when “Ma Bell” ruled the rates for telephone calls. Mr. Lapsley was the guest of honor at a reception on Friday, June 17 at The Telephone Museum from 5-7pm. JUNE 17: Reception for Phil Lapsley author of “Exploding The Phone”. 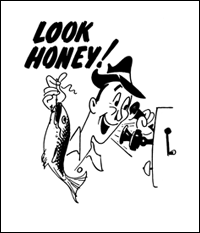 5-7pm at The Telephone Museum, 166 Winkumpaugh Road, Ellsworth, Maine. Admission $20. per person includes appetizers and beverages. Reservations requested: ttm.switchboard@gmail.com. 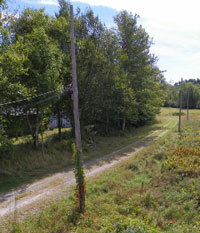 1-4pm at The Telephone Museum, 166 Winkumpaugh Road, Ellsworth, Maine. Short talk by Phil Lapsley author of “Exploding The Phone” at 1pm; book signing throughout the day. Admission price of $10. per adult and $5. per child includes exhibits in Main Building and Visitor Center. Free admission for museum members. The Telephone Museum joined other science and technology oriented exhibitors at The Maine Science Festival at Bangor’s Cross Insurance Center in March. The Festival, which took place on March 18, 19 and 20 at various locations around Bangor, is in its second year. The mission of the Festival is “to stimulate interest in science among the general population, to heighten awareness of the impact of science on everyday life, and to demonstrate the diversity of scientific enterprise in Maine. This year’s Headliner speaker was Nate Silver, statistician, author and founder of the website FiveThirtyEight. 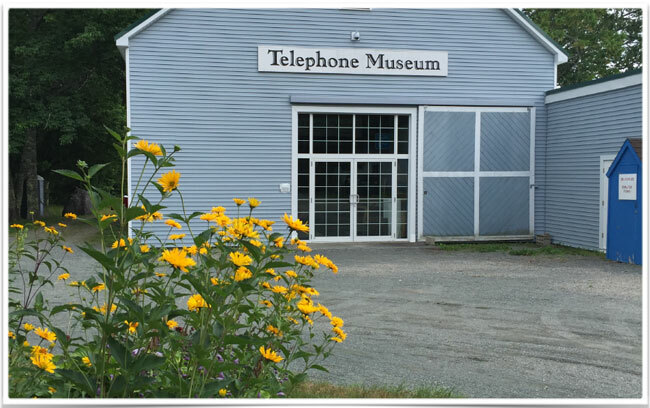 The Telephone Museum in Ellsworth, Maine is now the first museum in the United States to display the recently launched NoPhone device. Invented last year and produced with the help of a Kickstarter fund-raiser, the device was featured at the Museum Angewandte Kunst in Franfurt, Germany earlier this year. Unlike The Telephone Museum’s working, interactive exhibits of telephones and pre-digital telephone switching equipment, the NoPhone is inert. Although its shape and size would suggest otherwise, it does absolutely nothing. A merely palliative tool for those who are obsessively attached to the real thing, the NoPhone offers relief from the day-to-day demands of cell phone ownership, and a chance for its users to re-engage in human-to-human relationships. It brings the art of telephone communication full circle: from Alexander Graham Bell’s quest to transmit human speech, to the restoration of personal interaction. The NoPhone is a technology-free alternative to constant hand-to-phone contact. In other words, it is a piece of plastic in the shape of a smartphone that helps people stay connected with the real world. In April the NoPhone was featured at the Museum Angewandte Kunst in Frankfurt, Germany in an exhibit entitled: “Hamster Hipster Handy”. The exhibit explored the positive and negative qualities of the mobile phone or “handy” as it’s known in Germany. Hamster – because radiation experiments were conducted on rodents – represented the negative consequences of cell phone use. Hipster referred to the penultimate 21st century consumer, infatuated with the endless possibilities of technology. How pervasive is this compulsory need in humans to continuously engage in physical contact with a piece of plastic? On average, a single smartphone will use its technological wizardry to summon its user 150 times a day. The NoPhone was created to combat the rapid decline of real life social interaction. It’s sleek, plastic design serves as an idle hand’s security blanket and is devised to placate the constant need to hold a mobile device while allowing users to fully experience their immediate surroundings. 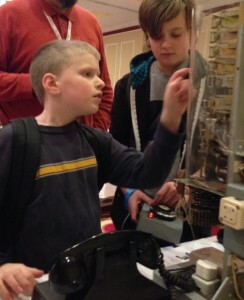 The Telephone Museum’s booth at the recent (March 19-21) homeschooler convention at the Samoset Resort in Rockland was VERY well received. The Strowger demonstrator had a busy time, as did the two magneto phones. There was a good deal of interest in the story of the museum, and much curiosity about the step-by-step machinery. 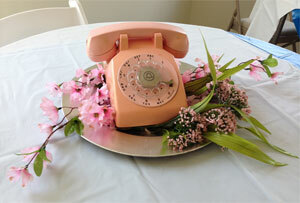 The little dial demonstrator received a lot of use, too – kids had to learn dialing skills before using the “real” phones. Needless to say, they caught on quickly! This was the first year that the convention had placed all the “hands-on” exhibitors in a room of their own. The other science and/or museum vendors were also busy, and new friends and connections were made. It was a very complimentary crowd. Education, co-operation, collaboration = success. Congratulations to HOME on a successful convention! Many thanks to Dave Thompson who made the connection with Homeschoolers of Maine, and who organized the exhibit. And thanks to several museum volunteers who gave many hours to commute to Rockport to help out at the booth. Please check out the “Calendar and Events” page of this website to see what’s happening next – and find out how YOU can be part of the fun! Tune in to this video to find out what our two most experienced tour guides (telephone guys, Down East Pioneers, board members, fixer-uppers, level-headers, etc. etc.) have to say about The Telephone Museum! Scurrying to install rest room signs, grading the entrance with rakes and wood chips, bringing in food and drinks, cleaning and decorating, museum board members prepared to celebrate years of planning and fund-raising with the Grand Opening of the Visitor Center at The Telephone Museum. On May 15, 2014 the museum board greeted Ellsworth Area Chamber of Commerce members and Visitor Center donors to the first public event in the new building. More than 80 people attended, with the overflow crowd heading into the Main Building where volunteers Chad Perkins, Rick Miller and others dispensed information about the museum’s exhibits and mission. A bewildered “by chance” visitor from Utah arrived just as festivities were beginning and agreed to join in on a tour as a paying guest! 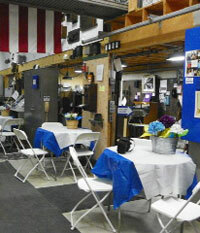 Inside the new building, people crowded around tables laden with food donated by Friends and Family Market, and sat down at tables decorated with colored telephone sets surrounded by artificial flowers in complimentary hues. New Land Nursery sent a beautiful bouquet of live flowers for the registration table and decorated the driveway entrance with rhododendron bushes. In addition, The Telephone Museum board was pleased to welcome Ellsworth City Manager Michelle Beal, who had been present for ground-breaking ceremonies in June 2013, and Maine State Senator Brian Langley and his wife, owners of the popular Lobster Pot Restaurant in Ellsworth. The highlight of the evening was the presentation of a check for $1000. from the Bangor Savings Bank Foundation’s Community Matters More Campaign. The award honored the museum’s selection as a participant in the campaign and was presented by Sheryl Edgecomb, Bangor Savings Bank Vice-President and manager of the Ellsworth Branch. The success of this event is fortuitous, as the museum intends the Visitor Center to be used for community-based activities, volunteer orientations, and special meetings and events for the museum and other area organizations. Most importantly, by extending the museum season to include the regular school year, the building will be the starting point for educational programs focusing on the history of telecommunications as illustrated by the museum’s working exhibits and extensive collections.